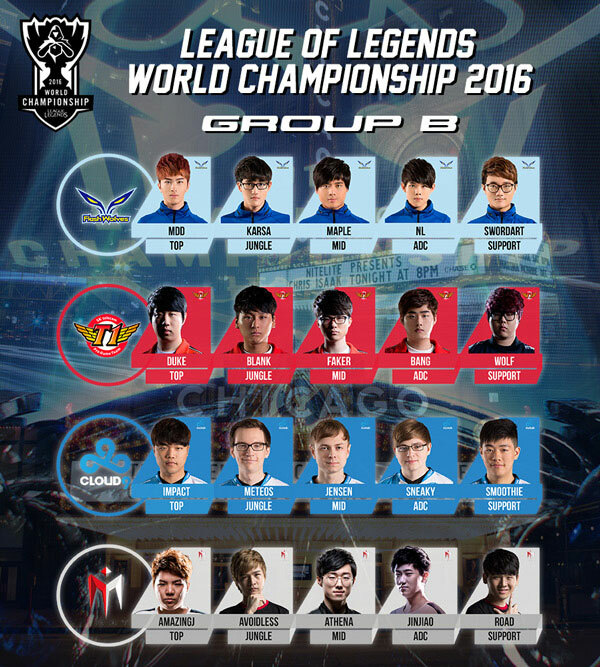 Group B at LoL Worlds 2016 features the following 4 teams: Flash Wolves, SK Telecom T1, IMay and Cloud9. Although coming in as second seed into Group B the reigning world champions of SK Telecom T1 are definitely the favorites for advancing into the Knockout Stage of the tournament. The dangerous Flash Wolves from Taiwan already showed great success at the 2016 Mid-Season Invitational tournament, however the international competition is stronger than ever. Despite only being third seed from the North American LCS, Cloud9 are in contention for withstanding the group stage of the 2016 LoL Worlds. The Chinese team in Group B, IMay, seems to be weaker than all of their opponents but you can never count out a team from the LPL. Each team will play a total of 6 games over 4 days, before the top 2 teams advance to the Knockout Stage of the LoL World Championship. SK Telecom T1 and Cloud9 will play the first game of Group B on Friday, September 30th, starting off a thrilling group of surprises. Team Region: LMS Teams at LoL Worlds 2016. Flash Wolves have shown great strength over the course of the year, during 2015 they were unable to thrive in the World Championship and although they made it out of the group stage they never got to push through the knockout stage. In 2016 I expect Flash Wolves to really bring some drive as they’ll be looking to push further than they ever have before. Flash Wolves have stuck with their strong roster line-up, for the most part, and have only improved since the 2015 World Championship. They’ve got a difficult group to get out of though, Cloud9 from NA and SKTT1 from the LCK are both looking to take the top positions in the group and if the Flash Wolves are going to contend this they’re going to need have stepped up their macro management and vision control of the earlier stages of the game. Flash Wolves can be an extremely aggressive team that pressure and push a lead to great extents but if they fall behind they’re often stuck. To conquer the group they’re going to want method around their madness, working strategically but not letting down their aggressive control and pressure. SK Telecom T1 is the first World Champion team to make it back with the opportunity to defend their title. They didn’t have the best season, a few weak points kept them from thriving, but in the end they qualified and they’ve been given this great opportunity. SKTT1 have always been a methodical and formidable team, they’ve got great strengths but have recently shown that they slip. They’re going to need to avoid these smaller mistakes on the Worlds stage as just 1 single mistake can throw away their opportunity. SKTT1 have had a slightly better than average season, they were controlling the spring split and even dominated the mid-season invitational tournament but once summer had begun they were crumbling. SKTT1 are going to need to get in as much practice as possible as they’ve got expectations to live up to and they’re not going to want to let anyone down. I think SKTT1’s biggest issues are going to come when facing off against Cloud9, if they can get past the NA team then they could push for the no.1 seed in their group. Qualified by: Winning the LPL Regional Qualifiers Tournament. I May were quite a surprise when they qualified for the World Championship. They had a gruelling barricade to get past and they took no prisoners when they rammed their way through the LCK regional qualifiers tournament. They took down one of the other favourite competing teams and had proven that they deserve their position at the world championship. After they ended in 3rd place in their summer split group, things looked tough for IMay. They had many challenges ahead of them such as Team WE, Snake Esports, Royal Never Give Up and even Edward gaming. Although they didn’t come out on top of all of the matches they managed to take the ones that really counted, their performance during the summer playoffs had them pushed into 3rd place which got them the 1st seed in the regional qualifiers, with this they managed to take their Worlds ticket after a single series! I May have a lot to show during the 2016 World Championship and as it’ll be one of their first international appearances they might be lacking experience when it comes to other competing regions. They’re going to want to gather as much information as they can and adapt to the upcoming World Championship patch to try and stay ahead of the game, they’ve got fairly good macro management and micro mechanics so they have the potential to push out of this group if things go well. Qualified by: Winning the NA LCS Regional Qualifiers Tournament. Cloud9 faced many difficult tasks when striving for their ticket to the 2016 World Championship. They were faced with multiple opportunities that passed them by; when they were in the Playoffs the teams in their region feared them because of scrim performances. This lead to fans believing they would make it with relative ease but after their defeat to TSM in the summer playoffs some people became sceptical. This scepticism was quickly destroyed as they took down Immortals in the regional qualifiers tournament to earn their place. It certainly didn’t come easy though! Through their journey they watch 2 tickets fly by and the stress levels must have been huge. This just means that the pressure of the Worlds stage won’t get to them, their recent performances have been phenomenal and they’re looking to take a high seed in this group but they’ve got a few formidable teams to try and get past first. Their team fighting is spectacular but they often make smaller mistakes which throw them behind, teams will pick up on this and abuse it so C9 are going to need to tread carefully if they want to push further than any NA team before them. This is a particularly troubling group, on one hand you have the previous World Champions who’ve been having trouble in their own region recently and on the other hand you have teams that rose and conquered everything in their way to make it this far. IMay look promising but they’re against extremely experienced teams and I think they’re going to have the hardest time in this group.